Image courtesy of the Center of Prevention and Counseling. SUSSEX COUNTY, NJ – Have you ever wondered how you can help support yourself or those you love in recovery from alcohol and other drugs? Are you, yourself or someone in your family or a loved one in or attempting to maintain recovery from alcohol or other drugs in Sussex County? The Center for Prevention and Counseling is pleased to announce new and innovative programs and services to benefit those in recovery from substance use disorders as well as their families and loved ones. These new programs are fully funded by a grant through the Sussex County Department of Human Services and are offered at NO COST to those in our community. 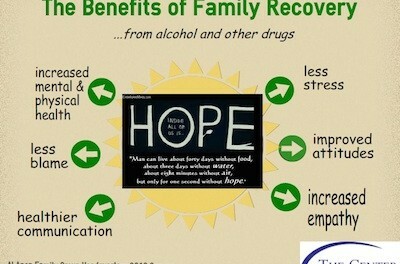 These recovery support services include: recovery progress & goal setting with weekly support, telephone support, support for those on probation and parole, family support groups, alumni support (from all agencies), anger management, trauma, cravings and relapse prevention support, as well as new educational, recreational and inspirational activities. The Center is also seeking members to join a Recovery Advisory Board in order to supplement, encourage and understand the issues, needs and local conditions that exist in Sussex County for everyone attempting, achieving and/or sustaining recovery from substance use. Substance use disorders, just like cancer and diabetes are best addressed and can improve when individuals and their loved ones are offered ongoing support services. Any health disorder can benefit from efforts that engage a person’s support system- families, friends and loved ones. There is very promising and encouraging evidence that reports people with a substance use disorder can reduce the incidence of relapse when their support systems improve. 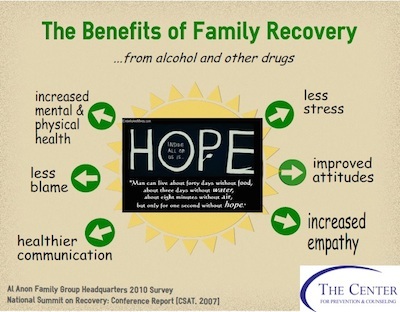 Family systems can become healthier, relationships can be mended and future generations are better able to earlier recognize symptoms and solutions for the disease when everyone in a family seeks recovery from substance use disorders. If you are looking to boost your recovery, obtain additional recovery support, or you and/or your family are in recovery and want to advocate for others to be able to attain and maintain recovery, please call Rachel at 973-383-4787, or email rachel@centerforprevention.org. In addition, we welcome inquiries from individual professionals, treatment programs, or other agencies who may have clients who will benefit from recovery supports. Please help us spread the word about these new and valuable services and we sincerely look forward to serving you and your loved ones.